A New Year family meal gave me the opportunity to visit The Gantry for the first time since it opened in the old Toads Mouth Too site. Brockley changed quite a lot while I was in Sydney and it strikes me that The Gantry is the perfect encapsulation of 'New Brockley'. I was a fan of Toads Mouth Too, but with it's wood panelled dining rooms, attentive service and stylish new menu The Gantry has smartened everything up. I think they've got it just right without going too far in the hipster / Shoreditch direction. We started with some complimentary house bread and butter. 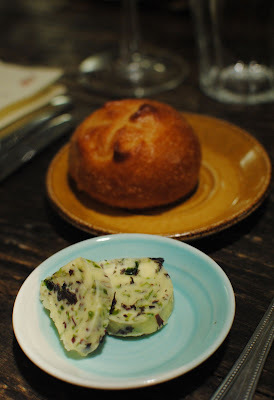 The homemade bread was a sign of good things to come with an inventive menu that was obviously cooked fresh by the kitchen. I decided to start with the Toscana Salad (£6.90) a mix of red chicory leaves, figs, mozzarella and parma ham. It was a lovely start to the meal with the sweetness of the figs offsetting the bitterness in the chicory. The mozzarella added a nice silky texture and the parma ham a salty flavour hit. As good as the individual components were I would have preferred a little bit more of the dressing to help bring everything together. For the main I went for the pain fried pork tenderloin cooked in ale, served with 'forgotten vegetables' and pain d'epices (£13.50). The 'forgotten vegetables' were some very enjoyable Jerusalem artichoke and lightly caramelised salsify. The pain d'epices was a bold alternative to stuffing. I found there was a bitter edge to the ale sauce which wasn't to my taste and meant I didn't enjoy the dish as much as I might have. My sister ordered the garlicky risotto (£6.50 starter size). I had a quick taste of the creamy risotto and according to my sister it was enjoyable. I resisted ordering a dessert but managed to sneak a taste of both the banoffee cheesecake (£4.50) and profiterolles au chocolate (£5.50). The cheesecake was my favourite. What's not to like about the double win of banoffee pie and a cheesecake? It was like two desserts in one. The Gantry is a great addition to the Brockley dining scene. The service was very friendly and attentive, and it's great to know that such a solid option has opened in the local area. If they could iron out a couple of small oddities (such as the vegetarian lasagna being the most expensive dish of the night and the sauce served with my pork) it could be a top spot. You can see all my London reviews on a handy map here. I find that profiteroles always promise more than they deliver. Drenching them in choc sauce seems a good way to mitigate the problem. wow!! This menu I think it taste good. Thanks for the info.